It’s finally here. You’ve been preparing for months and invested countless hours into the test that you hope will lead you to your future career. Perhaps you’re a little nervous now, but that doesn’t stop you from feeling confident. You are ready to take the bar exam. But as the clock strikes and you begin answering the first question, your biggest fear becomes reality. You tense up, your brain freezes, and you can’t remember what you studied. 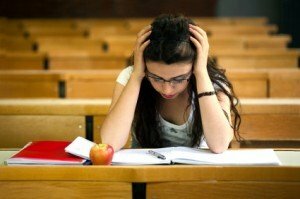 For many law students preparing to take the bar exam, forgetting material is the worst imaginable situation that could happen, and understandably so. But thankfully, there are ways to prevent it from occurring. Modern-day science indicates that there are psychological ways that test-taking can be improved, all relating to how the brain is wired. Recall is the process that occurs in which previously-stored information is brought to the forefront of the brain. In simpler words, it is remembering information. But before any stored information can be accessed at all, the brain must first learn, or encode, it. During the encoding process, a connection between two neurons is made as the brain acquires new information. If the connection is weak, the information is stored as short-term memory and is forgotten relatively quickly. If it is strong, the memory becomes long-term. Stronger connections can build between neurons over time so that, eventually, recalling information becomes easier and short-term memory is converted to long-term memory. Ultimately, this reveals that the key to better test-taking is making stronger connections between neurons before the exam. So how are these strong connections made? The secret is finding more effective ways to translate short-term memory into long-term memory by improving mental study habits. Of course, instead of figuring out how to study more efficiently on your own, AdaptiBar compiled a list of scientifically and psychologically-supported tips for studying that will help you while preparing for the bar exam. We made it easier for you to remember them by making them into an acronym using the word ‘CRAVE’. Concentrate – The average human attention span lasts between 15 and 20 minutes. That’s why training yourself to focus on one thing – bar exam material – during your study time is critical to remembering information during the test. If you are studying from notes or a textbook, it’s been found that the most effective way to study is in 50-minute chunks with a 10-minute break in between. Also put yourself in an environment with few distractions. If you’re someone who zones out a lot, try keeping a pen and notepad by your desk so that if you think of something you have to do, you can write it down and come back to it later. Repeat – Rumor has it that it takes anywhere between 7 and 20 times of repeating something in your head for you to remember it later. While there is no magic number that has been proven to accomplish this yet, repetition is still crucial to successful studying. According to scientists, we forget about 50% of what we learn in a 24-hour period. That means that for repetition to be effective, it must take place over a longer period of time. Knowing something now doesn’t necessarily mean you will remember it the day of the bar exam. Be sure to consistently review old subjects as you learn new ones, and you will be much less likely to forget them. Associate – Does anything you are reading about relate to a lecture you remember from class? Does the information remind you of any story you may have seen in the news, past or present? Think of the answers to questions like these while you are studying. By making connections through associations with previous experiences, brain activity will increase and stronger memory-related connections in the brain will form. Visualize – Put images to words, whenever possible. By assigning a particular mental picture to the topic you are learning, you are actually engaging an entirely different portion of your brain in the encoding process than what is engaged by reading or listening to content. This part of the brain, the occipital lobe, specializes in storing memory. Engage – Be an active learner. Summarize information in your own words after you’ve read it, ask questions as you go along, and find opportunities to peak your interest whenever possible. By actively assigning greater importance to the material you are studying rather than passively skimming over it, the brain releases chemicals that form stronger long-term memory. Now, without looking back at the previous paragraphs, can you remember what CRAVE stood for? It is likely that you can recall what word each letter represents better than you would have without the use of an acronym. Try this method during your studying, too. Grouping information, also called ‘chunking’ by psychologists, consolidates memory space in the brain. Scientists have determined that the maximum number of letters that should be used to effectively memorize information using acronyms is 7. During sound sleep, the brain releases memory-cementing chemicals. These chemicals then allow for the brain to organize, file, and store information that it has acquired throughout the day. Believe it or not, many studies have even indicated that an extra hour spent sleeping is more beneficial than an extra hour spent studying because the brain has more time to process and retain information. Tip: Shoot for 7 to 9 hours of sleep a night, regardless of whether or not you got through studying as much information as you were planning on for the day. If you have trouble falling asleep at night due to over thinking or stress, try doing some sort of relaxing activity before you go to bed such as listening to soothing music or taking deep breaths. The hippocampus is a compartment of the brain that aids in learning and memory. Scientists have discovered that stress can actually make the hippocampus weaker. Stress also slows down the brain’s ability to produce new cells, preventing sufficient blood flow to the brain and halting the retention of new information. Tip: Don’t procrastinate. The bar exam is stressful, but if you begin to study well in advance, you’ll feel more confident and prepared by the day of the test. Take deep breaths, eat healthy, and think positively. Make time for fun events and relaxation, too. Allowing time now for something you enjoy doing will help you refocus later. Studies indicate that exercise not only maintains memory, but improves it. As soon as heart rate increases, the brain tells the body to release adrenaline and extra energy into the bloodstream, both of which chemically boost memory. Tip: Make time for 30 minutes of exercise a day, focusing on aerobic exercises. It doesn’t have to be done all at once. Take three 10-minute walks or two 15-minute ones if it works better with your schedule. If you only have time to work out two or three days a week, shoot for an hour-long workout. Any exercise is better than no exercise. Remind yourself that it’s okay to take a short break every once in a while, especially when it will help your long-term memory. Now that you’ve learned how to make stronger connections in your brain to help you study and recall more information, imagine yourself the day of the bar exam once again. You’ve been prepping for months using AdaptiBar’s proven preparation method. You’re a little nervous, but you feel confident about the material and the psychological techniques you used to memorize it. In fact, you’ve also been exercising, sleeping well, and managing your stress level. You are ready to take the exam. As the clock strikes and you begin answering questions, you are able to recall all the information that you studied. You walk out feeling confident that you just passed the bar exam.